Joseph Henry was at the forefront of the great electromagnetic advances of the 1830s. He built the world’s most powerful electromagnets and made practical breakthroughs that allowed Samuel Morse to invent the telegraph. 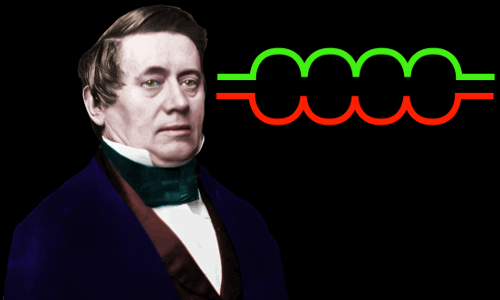 The unit of electrical inductance is named the henry in his honor, with the symbol H. For most of the second half of the 1800s he was America’s most renowned scientist. Joseph Henry was born in Albany, New York, USA, on December 17, 1797. He was the only child of William Henry and Ann Alexander, both of whom had emigrated with their families from Scotland in 1775, a year before America’s Declaration of Independence. Joseph’s father worked as a day laborer on boats sailing on the Hudson River, but his health was poor; he may have been an alcoholic. At the age of seven Joseph was sent to live with his uncle, aunt, and grandmother in Galway, New York, about 35 miles away. In Albany his mother tried to nurse his father back to health, but without success; his father died when Joseph was nine. Joseph did not enjoy school in Galway, and when he was 13 he moved back to his mother’s home in Albany. He began an apprenticeship to a watchmaker. Albany’s economy was in poor shape though, and after two years the watchmaker closed his business. The young boy and his mother scraped a living; his mother took in boarders, and Joseph began to take an interest in the theater, hoping that one day he would become a great actor. One of the boarders in his mother’s house loaned Joseph a book with the title: Lectures on Experimental Philosophy, Astronomy and Chemistry, Intended Chiefly for the Use of Young People. Joseph became completely absorbed in the book. The boarder, whose name was Robert Boyle, (not the Robert Boyle) was so impressed with Joseph’s passion for the book that he gave it to him. Joseph began earning money by teaching in local schools. In 1819, aged 22, he was offered free tuition at the Albany Academy. He was identified as a brilliant student, and he tutored other students to support himself financially. He graduated in 1822, after studying mathematics, chemistry, and physics, then continued working at the Albany Academy as a laboratory assistant. He left to begin work as an assistant civil engineer in 1824. In 1826, aged 29, he returned to the Academy as an assistant teacher and in 1828 he was promoted to Professor of Mathematics and Natural Philosophy. He was now in a position to carry out serious scientific research. It is worth saying that the parallels in the lives of Joseph Henry and Michael Faraday are rather striking. Both were born in poverty; had fathers who often could not work because of ill-health; became apprentices; were inspired to become scientists by reading particular books; were devoutly religious; became laboratory assistants; made their greatest contributions in the field of electrical science at the same time; and both have an SI unit named in their honor. 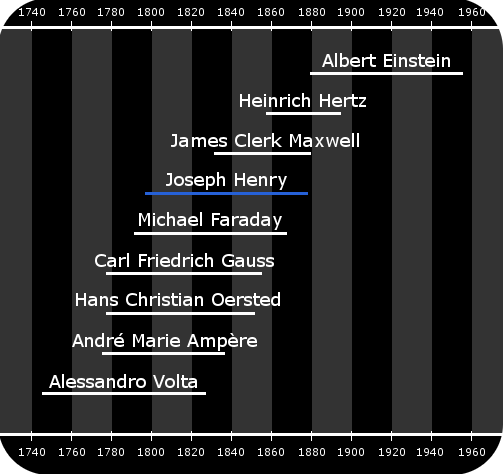 Henry’s lifetime and the lifetimes of related scientists and mathematicians. Henry was interested in our planet’s natural magnetism. This interest drew him into his work with electricity and magnetism. Electromagnetism was a very new field when Henry started his investigations. In 1800 Alessandro Volta in Pavia had invented the battery, and for the first time a constant electric current could be produced. In 1820 Hans Christian Ørsted in Copenhagen had discovered that when electric current flows through a wire, it produces a magnetic field around the wire. In this way Ørsted established a new scientific phenomenon called electromagnetism. In 1825 William Sturgeon in London made the world’s first electromagnet. Most of us have, at one time or another, made an electromagnet. We coil an insulated wire around a piece of iron and connect the wire to a battery. When electric current flows through the wire, the iron becomes magnetic. 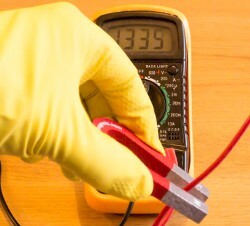 The iron-cored electromagnet produces a much stronger magnetic field than the wire would on its own. winding more and more coils around the iron produced a stronger electromagnet up to a point, but then no further. (We now know that this is because as the wire gets longer its resistance increases.) Henry realized that by coiling several shorter pieces of wire connected in parallel around the iron he got more current flowing through more coils, which greatly increased the strength of the magnet. 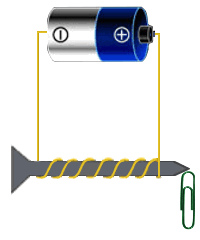 In 1830 Henry built the world’s most powerful electromagnet, the Albany Magnet, lifting as much as 750 pounds (almost 350 kg) of metal at a time, a huge increase on the 9 pounds (4 kg) achieved by Sturgeon. By 1831 Henry’s electromagnets could lift more than 2000 pounds (over 900 kg). In 1833, after moving from Albany to Princeton, Henry built a new record-breaking electromagnet capable of lifting 3300 pounds (1500 kg). 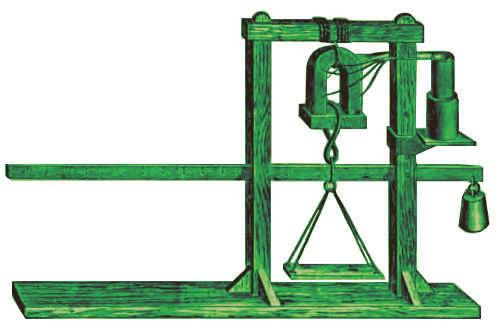 Henry used the apparatus pictured above to test the lifting strength of his electromagnets. He built his apparatus and his magnets with his own hands. While experimenting with ever more powerful electromagnets, Henry made an interesting discovery. He found that to send electric current through a very long piece of wire a high-voltage battery was needed. Using high voltages he could transmit electrical current over larger distances than previously possible. It occurred to him that he could combine this discovery with one of his electromagnets to transmit a signal. In 1830 he demonstrated this to Albany students. The students gathered around a bell and saw Henry cause it to ring from 1000 feet (305 meters) away. The electric current traveled along 1000 feet of wire, activated an electromagnet, which attracted a metal pivot, which rang a bell where the students stood. With more work, he extended the distance he could ring the bell to about a mile. Henry had therefore demonstrated two potentially useful new devices: the telegraph and the doorbell. He did not attempt to patent these – he thought of himself as a pure scientist, not a financially driven inventor. The ‘telegraph’ demonstrated at Albany could not work over the long distances required for a fully practical telegraph. But Henry had a way of overcoming this problem. The key to longer distance transmission is a device called a relay. A relay is a switch that is opened or closed by an electromagnet. In a telegraph line, a relay takes a signal arriving from one circuit and re-transmits it to another circuit; in this way a long telegraph line can be made up of much shorter lines, each individually powered and linked by relays. …except for a small footnote. Henry cooperated with Morse and lent him support at critical times in the telegraph’s development, but in the end he became resentful, believing that Morse never sufficiently acknowledged the part he played in inventing the telegraph. As mentioned above, when a wire carries an electric current, it produces a magnetic field. Another way of saying this is that when electric charges move, they generate a magnetic field. Henry wondered if this relationship could be mutual. Was it possible that a moving magnetic field could produce an electric current? He proved this was the case in 1832. The phenomenon is called electromagnetic induction. Henry discovered it independently of Michael Faraday, who discovered it in 1831. Using moving magnets to generate electricity is the basis of nearly all modern electric power plants – including nuclear, coal, gas, hydro, and wind. Induction is a exchange of energy between electricity and magnetism. A changing magnetic field produces an electric current in a conductor. In 1832 Henry discovered that when the amount of current flowing in a wire changes (and hence the magnetic field changes) it induces a voltage in the wire which opposes the change in current. This can be pictured as a form of electrical inertia. It is called self-induction. Henry also discovered mutual induction, in which a changing current (and hence changing magnetic field) in one wire induces a voltage in any wires that are nearby. Michael Faraday discovered mutual induction some months before Henry did. The unit of electrical inductance is named the henry, with symbol H, in Henry’s honor. Henry’s most productive years as a scientist were those he spent (1826 – 1832) at the Albany Academy. He married his cousin Hariet Alexander in 1830, with whom he had a son and three daughters. At the age of 35 Henry moved from Albany to take a professorship at the College of New Jersey, now Princeton University. He spent the years 1832 – 1847 at Princeton. In 1837 he traveled to the United Kingdom where he met and talked shop with Michael Faraday and Charles Wheatstone. In 1847 Henry became secretary of the newly established Smithsonian Institution in Washington D.C. He remained at the Smithsonian until his death, building it into a major national institution. 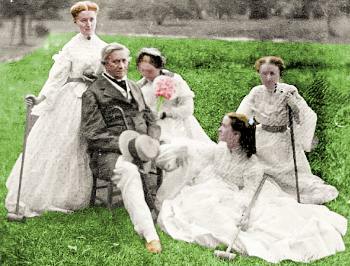 Joseph Henry relaxing after a game of croquet with his wife Hariet and daughters Mary Anna, Helen Louisa, and Caroline. Photo c. 1865. Reingold, Nathan, ed. The Papers of Joseph Henry, The Albany Years, December 1797 – October 1832, vol. 1. Washington, D.C.: Smithsonian Institution Press, 1972, pp. 251-54, 274. Enhanced and part colorized by this site. Joseph Henry died at the age of 80, on May 13, 1878 in Washington, D.C. He was buried in Oak Hill Cemetery, Washington. "Joseph Henry." Famous Scientists. 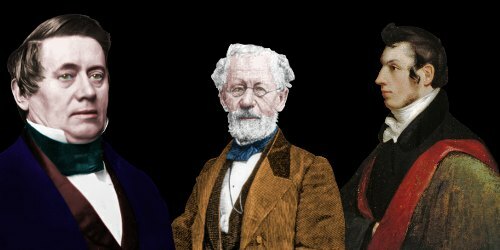 famousscientists.org. 4 Sep. 2015. Web.